A Korean sled has gotten the gold medal in four-man bobsledding at the Pyeongchang Olympics. At least, that's the way it went in rehearsal. Ordinarly at these Olympics, when an athlete or team wins a medal there was a brief ceremony at the venue where they competed _ followed by another ceremony in another location, often the next night, where they would actually receive their medal. 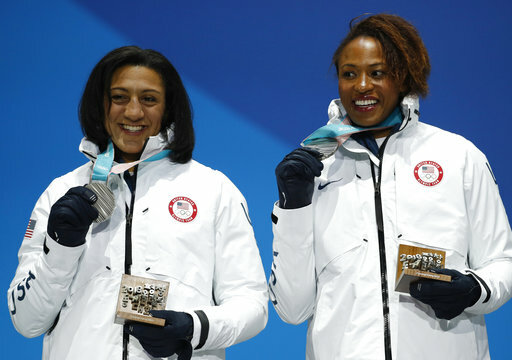 With the Olympics winding down, medals are now largely getting handed out where competitions are happening. So at the Alpensia Sliding Center, they actually went through a full rehearsal for Sunday's medal ceremony for four-man bobsled (and for purposes of that rehearsal, Korea was announced as the winner). Volunteers stood on the podium in place of the 12 sliders that will be on those steps, while another volunteer pretended to hold a tray of medals and yet another volunteer pretended to place the medals around the winners' necks. The public-address announcers went through their script, just as they will Sunday, and the Korean national anthem was even played when rehearsal was complete. And yes, when it was over, two of the "medal-winning" volunteers posed for a selfie _ without a camera.